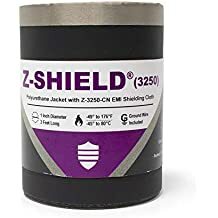 Hook N Shield Sh1 - Emi Jackets And Expandable Sleeves - Emi Shielding - Products - ZT | Zippertubing Co.
A very thin and lightweight jacket that offers outstanding EMI-shielding performance. This jacket utilizes our very popular, soft rubber-like, PVC film 63-10 as its protective outer layer. This versatile jacketing material offers good abrasion resistance as well as fluid resistance. The Hook-N-Shield® (SH1) features a SH1-laminate shielding foil that makes this solution perfect for areas with high electrical interference such as electrical racks and cabinets or other areas that will see limited flexing during operation. The Nylon hook-n-loop closure makes this jacket ideal for installations where a quick field deployment is required. This jacketing system also includes a sewn 3/16" flat tin/copper ground drain wire. This product should be your first choice if you are looking for a highly effective EMI shield that is lightweight and requires no additional tooling during installation or re-entry. SH1 Laminate is a lightweight shielding material that consists of Zippertubing's SH1 shielding foil adhesively laminated to our Type 63-10 Polyvinylchloride jacket material. It can be combined with most Zippertubing closure types to create a thin, lightweight cable jacket with outstanding EMI shielding performance. 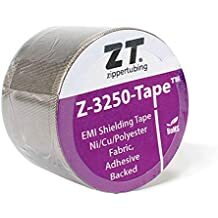 The material is a general purpose shielding product that is ideal for use in protected areas like electronics racks, and should not be used in areas where a great deal of flexing is likely to occur. It can be configured for Round, Flat and Rectangular cable shapes and is supplied with a sewn-in 15 AWG braided Tin/Copper ground wire running the full length of the product. The lamination is flame retardant and can be Certified to UL224, VW-1 flammability upon request when ordered with our PVC R-Track or Z-Track closures. Electrical: Resistance 0.091 ohms/mft @ 1.0"